Cool off with this refreshing dessert! Even as we near the Autumn equinox, it’s still hot outside. What better way to cool off and put a pep in your step than with some coffee jelly! It’s great as an afternoon snack or a light evening treat. In America, gelatin is a powdered protein derived from the collagen of animal’s connective tissues, a process refined in the early 1800s. It’s typically sold in boxes with bright colors and fruity flavors. In Japan, gelatin is a more humane product that’s derived from seaweed. In the Edo Period around 1650, Mino Tarōzaemon discovered agar by accident after leaving leftover seaweed soup out in the cold. It burst onto the Japanese culinary scene and is used widely as a style of dessert known as kanten, the Japanese word for agar. Its most popular dessert preparations include anmitsu, fruit jelly, and neri yokan. 300 years after agar’s initial discovery, coffee jelly makes its first recorded appearance in Tokyo. Kanasaka Keisuke of Mikado Coffee created the first marketed coffee jelly (kohi zeri, コーヒーゼリ) as “coffee you can eat”. And eat it we shall! Coffee jelly is refreshing, slightly sweet, light, and a bit bitter. It’s commonly served as is, with sweet cream, whipped cream, or even submerged in cold brew like boba tea. Let’s talk more in depth. Agar agar is available in a few different forms: powder, flakes, and bars. The powder form is the easiest to work with because it dissolves more quickly than the others. I had to use agar flakes because my local grocery store didn’t carry the powder. It works, but it took me about 30 minutes to dissolve in the coffee. Agar bars and threads are dehydrated agar processed into long bars or threads. I’ve never used them, so I don’t have much insight into their efficacy. As for the coffee, you can use whatever is your favorite. A lot of recipes use instant coffee powder, but I find the taste to be rather dull and uninspiring. Instead, I recommend brewing a fresh pot of your favorite roasted coffee to increase the nuanced flavor of your jelly. The stronger you brew your coffee, the more bitter the jelly will taste. Bonus ingredient: Chocolate! If you’re feeling daring, add a square of dark chocolate to your coffee concoction before adding the agar agar. Now let’s discuss serving and toppings: the options are endless! Generally, Japanese coffee jelly is served in cubes covered with sweetened heavy cream (yum!). 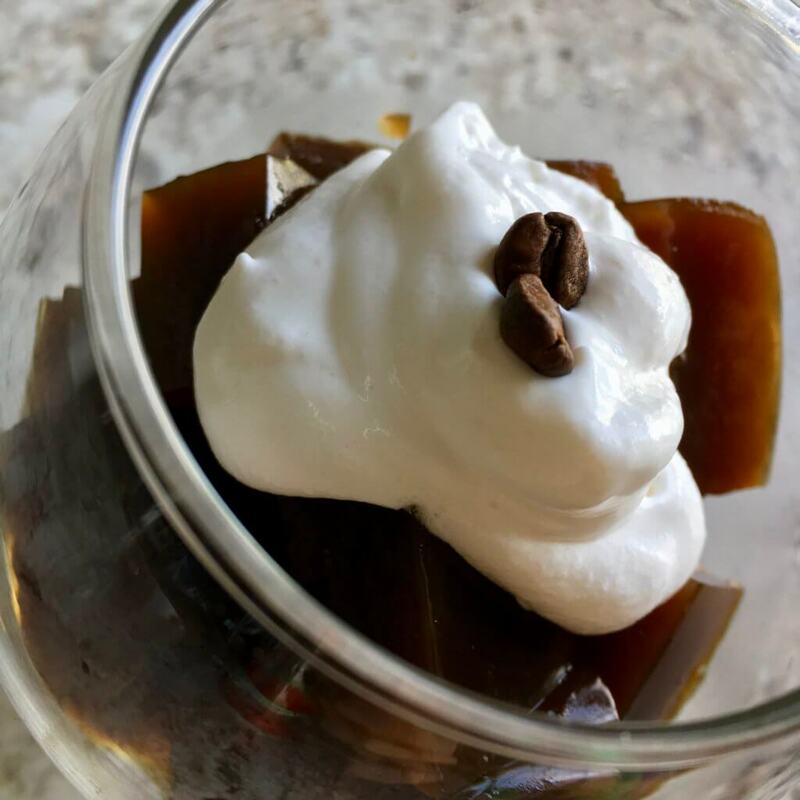 Cubed coffee jelly is also delicious topped with whipped cream, garnished with a sprig of mint, a tiny coffee bean, or sprinkled with espresso powder. There are coconut cream and coconut whipped topping available commercially for non-dairy options. 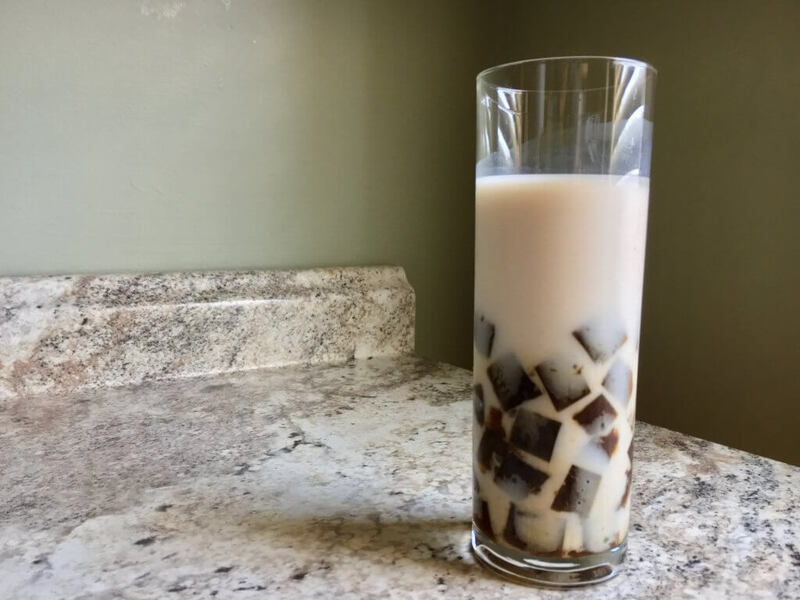 If you want to go the extra mile, serve coffee jelly with ice cream, or cut it into smaller cubes and drink it like boba in 1-2 cups of your favorite sweetened milk beverage. I poured lightly sweetened vanilla almond milk over my coffee jelly, and it was divine! 1.5 tsp. agar-agar powder (or 1.5 Tbsp. agar flakes). Note: Agar agar is different than kanten (another Japanese gelatinous substance), so if you use kanten instead, the result will be a rather firm texture. Garnish with mint leaf, espresso powder, or a coffee bean. Add the agar-agar, and stir until dissolved. This will probably take a while, so keep stirring until you don’t see any crystals or powder remaining. Stir in 2 tablespoons of sugar, and taste. Adjust accordingly. Pour into individual glasses or into a flat container, and refrigerate until the jelly firms (at least 2 hours, if not longer). Serve individual glasses as they are, or slice the gelatin in the container into squares, then serve in a dish. To make your own: chill a can of full fat coconut milk for at least half an hour. The cream will separate from the liquid and rise to the top. Skim it off and use it as the coconut cream portion of this recipe. To save you a little time and effort, processed coconut cream is available as well. Whisk or beat ingredients together until sugar is incorporated and the liquid is thick. Use about 1-2 Tbsp. per serving of coffee jelly. Pour over the top and garnish as desired. Store leftovers in the refrigerator for 3 days. References: Builder, M. (2016, July 18). A Brief Introduction to Japanese Jelly. Retrieved August 08, 2017. A Brief History Of Agar. (2016, January 26). Retrieved August 08, 2017. Gelatin. Retrieved August 08, 2017. Coffee Jelly Recipe. Retrieved August 16, 2017. N. (2017, April 24). Coffee Jelly Recipe コーヒーゼリー • Just One Cookbook. Retrieved August 16, 2017.